Bicycle baskets: fresh flowers, groceries, everything is possible! Our bicycle baskets are not just stylish, but also incredibly practical. Whether you shop daily at the market, or commute into work by bike, our baskets are on hand to make your journey go that little bit easier. You’ll always have somewhere to stuff a freshly baked loaf from the bakers or tuck away your keys and little essentials before heading out on your next adventure. One of the strongest selling points of our bike baskets is that they can be very easily attached to your bike. You’ll find baskets that can be mounted at the front of your bike at the handlebars, on the front rack or at the rear on the luggage carrier. Super spacious bike baskets in our XL size are ideal for those big adventures outdoors, while our more compact alternatives are essential accessories for everyday life. Take your pick. Got a spare 10 minutes? Then you’ve got time to fit a front-mounted bicycle basket to your frame. Once you’ve installed one, you can enjoy stylish storage within easy reach for years to come, with no need to worry about clipping on and off each time you dismount your bike. Would you like the freedom to be able to leave your bike chained up outside of the house for a night without worry? The Basil Rattan Look bike basket range can be left in drizzly conditions with no worries whatsoever. Prefer to have your basket with you while shopping to load up on groceries? 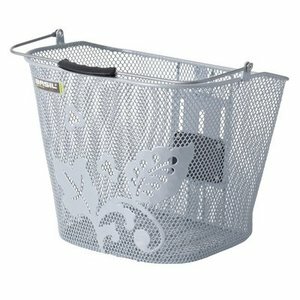 Opt for one of our removable bike baskets instead. A true classic beloved by cyclists everywhere, our wicker bike baskets are a time-honoured staple. These beautiful baskets instantly put you in mind of fresh flowers, country picnics and dreamy bike rides through the city on a summers day. For more laid-back adventures on your bike, opt for one of these woven baskets. No matter who you are or what you’ve got planned, Basil has a bike basket to satisfy your requirements. You’ll find an epic range of baskets for men and women, bike bags and baskets for children, not to mention handy bike baskets for your favourite canine. With our dog bike baskets, you can take your four-legged friend with you on your daily errands or trips to see friends and family. With a Basil basket, you’ll be able to enjoy your bike that little bit more. Enjoy shopping at the market or stocking up at the sales, savour a more serene ride into the office, or get sorted for the school day knowing that your daily essentials are all well stored in your Basil bicycle basket.